Dramaturgy Intern Clio McConnell blogs from inside the Lady Windermere’s Fan rehearsal room. Before actually landing one’s dream job in the real world, the average college student looks upon that prospect as a sort of utopian ideal: Naturally, one’s dream job involves spending all day doing something one enjoys and is good at. If one is lucky, of course, this utopia will eventually become reality. By that standard, hanging out at Cal Shakes this summer has been a really lucky break for me. The more time I spend in the rehearsal room for Lady Windermere’s Fan, the harder it is to imagine a better workplace. From the first read-through it has been clear that this early Oscar Wilde play is seriously complex, with a lot of complicated relationships and moral quandaries. But I assumed that director Christopher Liam Moore would have a vision to dive into straightaway—to my untrained mind, that is what a director does. Of course, Chris had a thoroughly better idea about how to approach directing. Stacy Ross (Mrs. Erlynne), Emily Kitchens (Lady Windermere), and Aldo Billingslea (Lord Windermere) in Cal Shakes’ production of Lady Windermere’s Fan by Oscar Wilde, directed by Christopher Liam Moore; photo by Kevin Berne. On the first day of rehearsal he spoke to a huge group of actors, designers, production crew, Cal Shakes staff, and donors, essentially saying to us: “I could tell you what I think this play is about. But instead, I’m going to wait for these actors to teach me what it’s about.” And from then on, the process of Lady Windermere’s Fan has been a great big learning experience—for everyone, I think (directors, actors, stage managers, dramaturg), but especially for me. Indeed, we have all learned (or been reminded of) a fair amount about Oscar Wilde and his London. We know about the peerage system—a Duke is higher than a Lord, for anyone who was wondering—and about how to properly convey one’s feelings with a certain wave of a fan. We know about 1870s fashion and train schedules and Victorian gentlemen’s clubs. Hopefully all of these fascinating minutiae will afford lessons that the audience can learn from their seats. But I have learned one thing above all that will not (and should not!) manifest in the final production: that this show has had a head-spinning trajectory of evolution. After the first day of work, I remember chatting with one of the actors and telling her how great her scene had looked (because it really had been lovely). She grimaced, saying, “No, no—let’s just forget about today.” This has been the overwhelming attitude of everyone involved: We can always know more and we can always change things. So, my utopian ideal of working in the theater is largely based on a dream to work with intelligent people. As far as that wish goes, I think I have fallen in with the right crowd, because the Lady Windermere’s Fan rehearsal room is pervaded by an air of intelligent wit—an air, I think, which Mr. Wilde would have much appreciated. Lady Windermere’s Fan, directed by Christopher Liam Moore, is on stage at the Bruns Amphitheater in Orinda from August 14 to September 8. Emily Kitchens (Lady Windermere) and Aldo Billingslea (Lord Windermere) in Cal Shakes’ production of Lady Windermere’s Fan by Oscar Wilde, directed by Christopher Liam Moore; photo by Kevin Berne. Philippa Kelly, resident dramaturg for Cal Shakes, shares her thoughts on the current production, and invites your questions. Lady Windermere’s Fan runs August 14–September 8, 2013. Lady Windermere’s Fan has an intriguing subtitle: A Play About a Good Woman. Written in 1892, this was one of Wilde’s earlier plays, a “drama” with farcical undertones, as distinct from the more broadly farcical The Importance of Being Ernest that would emerge a few years later. The entirety of Lady Windermere’s Fan takes place over a single day, which happens to be the protagonist’s 21st birthday. “I’m of age today,” she tells Lord Darlington, and we see her, over this 24-hour period, go through what Jonathan Moscone described at our Inside Scoop as “24 YEARS of experience.” Among other things, she comes to question what a “good woman” actually is in this fascinating drama that combines mystery, comedy, and a measure of malignity. Are you going to see our production of Lady Windermere’s Fan? Do you have questions or comments about the production’s cast, themes, creative choices, or anything else? Please leave them in the comments, and I’ll be sure to respond. In Victorian society—including that of Oscar Wilde and the dramatis personæ of Lady Windermere’s Fan— it was said that fans were used to communicate silently across a room. Some claim it was merely a myth made up by advertisers to sell fans, like what De Beers did with engagement rings and, less romantically, what Campbell’s did with green-bean casserole. Regardless, it’s a lovely idea, not unlike the language of flowers, a more ancient form of wordless-yet-poetical communication that also saw a rise in popularity during Queen Victoria’s reign. Here are just a few unspoken sentiments one could convey with this useful accessory. When you take in our production of Lady Windermere’s Fan, see if you can find any hidden meanings in the actors’ fan choreography! The thing is, we’re pretty sure our Cal Shakes community has some masters of the aphorism in its ranks. Fancy yours a Wildean wit? 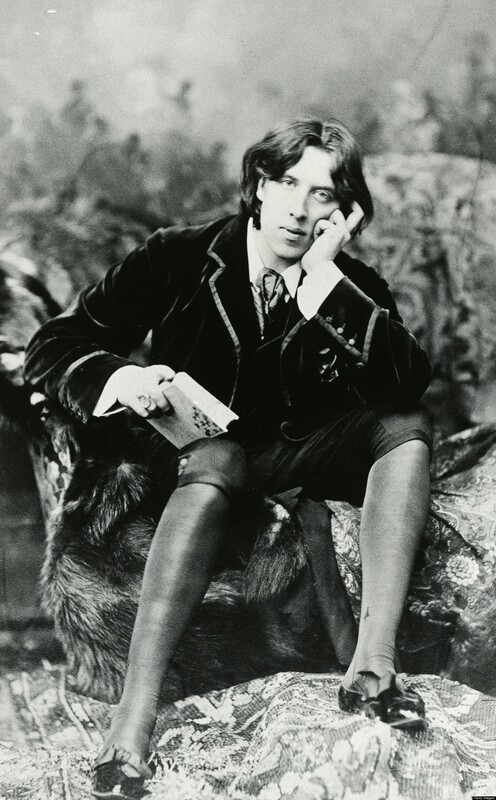 We hereby challenge you to come up with your own Wilde-style witticism, for fun—and prizes. HOW DO YOU ENTER? Comment here; tweet to @calshakes with the hash tag #Wildean; write on our wall at facebook.com/calshakes; or email marketing@calshakes.org. WHAT CAN YOU WIN? The ones we like will be published in our program for Wilde’s Lady Windermere’s Fan. The one we LOVE will earn its creator a pair of tickets to the show! So slip into something fur or velvet, sharpen your walking stick, gaze longingly into the camera…and get that wit cracking! Contest ends July 17. Lady Windermere’s Fan begins previews at Cal Shakes on August 14, and opens on August 17. Get your tickets today.